We have been living on Gloriana for a few days while we clear and clean the house. One lives in a perpetually fraught state, surrounded by boxes and an assortment of cleaning materials. While the house slowly starts to look good the boat gets more chaotic. However by the Friday we were virtually there and I was able to watch the dreaded over-egged Royal Wedding while Nick spent the day clearing the garage, where piles of leftovers had been dumped. Although I had been ‘Mrs Grumpy’ about all the fuss in the weeks before, I confess that I becam e quite absorbed in the theatre of the day as presented by the BBC. Hungerford High Street looked splendid with Union Flags proudly displayed as if the Middletons haled from our town, rather than the other side of Newbury. I have spent the last few days stowing stuff and cleaning the boat. Although we have been enjoying a gloriously dry Spring, there has been a lot of dust, blossom, whatever, blown aboard and we seem to be sweeping up two or three times a day; balancing this however, is the benefit of dry doggy towels! We enjoyed a meal out on the Wedding night and while our tenant arrived bright and early on Saturday leaving me to do further stowing on the boat, Nick took my car to be moth-balled with our Kiwi friends, Kim and Alan near Wallingford. Now, before we set off on our travels three years ago I had sleepless nights worrying about how dear ageing Caspar would cope with the experience. In fact he took to the travelling life with enthusiasm, loving the fresh fields and pastures new as much as his master. Now he really is a dog of mature years with ailing back legs and needing veterinary support and extra consideration getting on and off. In spite of this he seems to be happy to be aboard and travelling again and is responding to the medication. On Sunday early we set off for Kintbury, where I (just) caught the train to attend Quaker Meeting in Newbury. It’s been good to be with Newbury Friends again but I’m being whisked off yet again. After staying on for the Monthly Meeting I walked through town and did a quick shop before being picked up by a very pregnant Emm and little Joe who joined us on the boat for Sunday lunch, roast pork with perfect crackling, prepared by Nick. Joe and Nick had a lovely afternoon together and Emm took a very tired little man home for bed and bath. We awoke to another lovely, but chilly day. It was a busy morning as the local Crafty Raft Race was happening, with Juniors starting from below the lock in Kintbury while adults started from Hungerford. A visual bonus for me was the horse-drawn boat heading upstream and past Gloriana. Magical!! As we travelled back towards Hungerford there she was, coming out of a lock. Returning to Hungerford, having given Nick Fritz and his wife Valentina a lift from Dun Mill Lock, we enjoyed lunch (4.00pm! ), followed by an ice cream from the Tutti-Pole whilst chatting to our new tenant Jeremy, and his friend Lisa, who were enjoying the late afternoon sunshine on the Wharf. Soon after seven, Nick went off to enjoy the Ale Tasting: for those who are not Hungerford-based, a relatively recent annual tradition associated with Hocktide which originates from the 11th Century custom of checking the saleability of locally brewed beer which was at that time drunk in preference to water (for health reasons!). For a full account of Hocktide, take a look at the relevant part of the Hungerford Virtual Museum. On Tuesday morning the temperature was down, cool with a strong easterly breeze. At half past eight the Tutty men had already started their rounds; Ben from Sugarmouse, the local sweetshop, and Jim Scarlett, as it happens, Jackie's cousin by marriage. Partly because of this connection, but mainly because of my insistent nature, I was able to prevail upon them to chalk up what I believe to be a "first": Tuttymen visiting a narrowboat. The main events of the day we were remote from, deciding that one Furr, the illustrious Constable, was all that Hungerford could deal with at one gathering. But in any event, other commitments in need of my attention before we leave Hungerford took up most of the day - well into the evening when, at half past nine I returned to the boat, putting our floral/herb displays under cover for the night in anticipation of a hard ground frost (after all, it is only May!). So we’re still very much in West Berks having set off from Hungerford on Thursday, due to Nick’s numerous meetings; even on Friday morning he had to catch the train back to Hungerford. We did the short journey from Kintbury to Hamstead Marshall on Friday midday lingering awhile in warm sunshine at Dreweatts Lock and travelling on through this especially lovely bit of the canal to Hamstead for supper. Overnight the extremely dry and warm Spring we have enjoyed for five or more weeks finally broke with heavy and thundery rain and lightning overnight. On Saturday the sun came out as we travelled on eastward and waited for Emm, Sean and young Joseph to meet us for the final bit of the journey into Newbury where we moored in West Mills, and where Caspar enjoyed all the comings and goings on the towpath. I visited the market where there was a colourful and tempting French Farmers Market alongside the regular set-up. After supper we spent a companionable evening with Jim and Jackie Bradshaw, the blokes managing to polish off a bottle of red wine between them and I managed the dregs of a bottle of rum and bottle of brandy with coke. Such decadence!! We had to lend our visitors a brolly because it had started to rain heavily again and continued again for most of the night. Sunday was a more sober day. I left Nick at Newbury Town Lock to go to Meeting where there was additional activity because Monthly Meeting had been reassigned at short notice. Consequently we had welcome visitors from Reading for Meeting for Worship and a not too long business meeting which I left early, concerned about Caspar’s welfare. I am such a fuss pot about him and it turned out he was fine as Nick and Simon were with him and I could have stayed! On Monday morning Nick went off for yet another meeting (Nursery School business! ), and returned with Emm and Joe, who stayed for lunch and helped with the gardening. We set off from Greenham yesterday, early afternoon, so we are truly on our way. Nick almost achieved all the objectives he had set himself in Newbury, while I did some shopping, saw my osteopath, and my sister. We had little Joe and Emm on board and Nick took a lovely photo of him watering flowers on the roof of the boat which he also posted on Facebook and had a prompt response from George in Delhi commenting on the size of his (Joe's) shorts..
On our journey east I was impressed by the loveliness of the K&A at this, the fresh, green time of the year. There are regular rivery bits of the waterway as the Kennet flows in at various locations. There are roses on pretty cottages in Woolhampton and Aldermaston and briar roses and elderflower are just in the early stages of flower – really early for early/mid May. And the air is full of seeds and dancing insects – more than I’ve ever known. It is impossible to sweep the boat without clouds of fluffy seeds flying up. Emm joined us for coffee in Aldermaston this morning and we have travelled on for just a few hours with a resolve to stay in Reading tomorrow and join the Thames on Friday intending to stay in Goring on Friday night travelling on to Wallingford on Saturday, possibly with guests aboard. Then we’ll be back to Pangbourne on Monday for a few days while Nick returns ‘home’ for more meetings! On Friday 20th I set off for my weekend away. Caspar is fine – he seems to be enjoying life aboard again; this afternoon he enjoyed a dip in the sandpit/vast boating lakes to the south of the M4. Ahead we see traffic on the M4, its noise muted by the noise of the water running over the lock gates in front of us. We will travel under it tomorrow morning. We woke at about eight, rising soon after, and were on our way into Reading by nine. Our mooring overnight above Garston Lock was very pleasant; far enough away from the M4 to be quiet, and close to the open expanse of the gravel pits, reminiscent of, but in no way comparable with, the meres of the Llangollen. 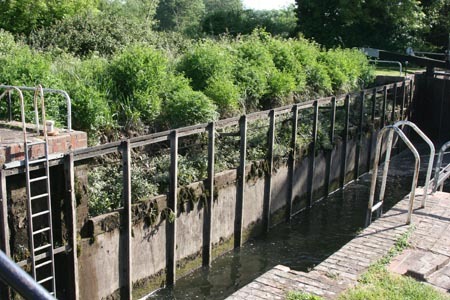 Garston Lock is a grass-sided lock, the first design used when the K&A was built but, if there were more, only two now remain. Water tops its upper gates, by design in many instances elsewhere, to allow a controlled through-flow of water when the lock is closed, though, as this lock also has a by-pass weir one wonders whether such is the case here. Significant leakage in the brickwork inside the top gate, with two bricks likely to be jettisoned in the mid-future, suggest these gates may be due for renewal. Passing under the M4 and through Burghfield and Southcot locks, we soon arrived at Fobney lock, the last bar the stoplock, County Lock, before our passage through The Oracle. Soon after one o'clock we were tying up beneath Reading gaol in Chestnut Walk. A very leisurely afternoon and evening passed, doing not much at all. Up at 8.30, and dropping through Blakes Lock onto the Thames at 9.00. An hour spent moored outside Tesco's enabled provisions to be taken aboard, and shortly before midday we were approaching Mapledurham Lock. By one o'clock in the afternoon we were moored alongside Pangbourne Fields, and whilst Jackie went into the village to get some strong flour for her breadmaking, I went on-line and made visual contact (on Skype) with our good friends, Hans and Inge Marie, in Kuala Lumpur. We were still chatting when Jac got back to the boat, having talked about our travel plans in Malaysia, scheduled for November. At 2pm we were rising through Whitchurch Lock, having made a special delivery of blank licence displays to the lock keeper, sent from his colleague at Caversham Lock. He remarked that the service was far superior to the Royal Mail. We arrived at Goring mid-afternoon but, unable to find a mooring with suitable on/off access for Caspar, we continued above Goring Lock and stopped for the night just below Cleeve Lock. Tomorrow morning, we will have to drop back down the Goring to pick up our passengers for the day - Allan, Kim, Lorraine and Graham. ...and now for the unabridged version. Yesterday we pootered gently into Reading – weather same old,same old, cool with the odd sunny period. At County Lock, the access to the lock, which was dicey, to say the least, back in September, was impossible. We would have had to trek up onto the Inner Distribution Road to gain access had there not been a team of police divers just downstream of the lock and they looked after us and guided us well away from the bubbles of their submerged diver. And they pressed the stop/go lights to enable us to zoom through the Oracle where there was an Italian Market. Chestnut Walk was busy but clever Nick managed to manoeuvre us into a tight gap which allowed access for Caspar. Right in the middle of this busy town I had one of the best night’s sleep in a while, whilst Nick had a restless night. This morning there were two delights: one was a mother and baby coot. Mum had what seemed a large berry (small marble size) which it passed to baby. who couldn’t manage it for more than a couple of seconds but mum repeatedly dived for it after it was dropped and gave it back. This continued with baby seamingly treating it as a game and dropping it instantly for mum to retrieve, until other babies joined in and nibbled the berry. Number two was what I believe was a greylag goose – mum and dad and thirteen goslings! The Thames is as lovely as ever – the width a tad daunting after the K&A. We did a quick shop in the mightily convenient, massive Tesco with riverside mooring and soon after ten we were through Caversham Lock and heading upstream through Purley stopping briefly in Pangbourne. We saw herons, a cormorant, fields awash with buttercups, stands of splendid tall yellow iris and even some yellow water lilies. We were unable to find a suitable place for Caspar to get off in Goring so we pressed on and found a meadow side mooring plus sheep. They certainly kept Caspar alert; they regularly approached but as soon as they came at all close he would give a short bark and they shot off to the other side of the meadow. I guess they kept forgetting there were visitors at one end of the field. I picked some orange blossom on a short walk this afternoon which is making the boat fragrant. Tomorrow we return to Goring to pick up four Kiwi friends and take them on up-stream to Wallingford and beyond. We are having a quiet Sunday afternoon and evening after a busy weekend. We returned to Goring, Saturday am, to pick up our long-standing Kiwi friends, Kim and Allan, and their Kiwi colleagues ‘in service’ to the money’d rich, Lorraine and Graham. After rising through the lock once more and travelling for a short while, we picked up yet more friends, from Newbury, Gill and Dave, below the Beetle and Wedge in Moulsford; they complete with freshly baked rock buns. The weather continued really cool with very occasional sunshine as we travelled up-stream to Wallingford; the girls cosying inside nattering, and the chaps weathering the elements at the helm. In Wallingford, Gill and Dave set off on foot to return to Moulsford on the Thames Path, and Kim and I did some shopping in town – this included the long-planned visit to the wondrous quilt and fabric shop, Village Fabrics. Only Nick was hungry, so on our return to the boat, we travelled on to Benson where Allan and Graham returned to Goring by road to retrieve the first-stage car, and on their return, onwards. The next bit was the least enjoyable of the day: we had been planning to find a picnic spot but there was absolutely no place where we could disembark Caspar. Then the heavens opened and A & G appeared in side whilst Nick continued to look for a mooring. I started cooking the sausages and burgers to feed everyone now truly hungry. We finally off-loaded Caspar for a comfort break at Shillingford Bridge after which we took our guests back to Benson. I returned with Lorraine and Graham to admire her recently completed quilt – truly lovely, while Nick returned with the boat to Wallingford. I was instructed in cutting techniques and she has loaned me a cutting board, cutter and measuring doo-free! I really have no excuse now and must ’crack on’ with my own initiate efforts. This morning I went to Wallingford Meeting which was, as expected,lovely. Wallingford has a small and, I believe, fairly ancient meeting house. I formed an impression of a powerful and supportive community. For the first half hour we were treated to the delightful babble of young Jamie. They are soon to have a Saturday Meeting to officially welcome him. They were also delighted that the Fair Trade shop in Wallingford, run by a member, had finally been awarded a long term lease. I had to drag myself away from the socialising after the Meeting as Kim and Alan were picking me up for Kim’s birthday lunch at Pierreponte, a new tearoom/eatery just by the pretty bridge spanning river and weir in Goring. I can thoroughly recommend a visit to this place for tea, breakfast or a celebration meal. Excellent value – but book for weekends! On Monday we picked up Howard and Maria Grace, friends from Newbury Meeting, in Goring, and they travelled with us to Pangbourne, enjoying the trip and particularly the wildlife. Armed with a sandwich, they then set off back to Goring on the path along the northern side of the river, having left us with a copy of Howard’s short autobiographical ‘Journey of a Lifetime’, which reflects on faith and belief. They have certainly lived a life of adventure and service and travelled all over! Nick left for his Lambourn and Hungerford governor meetings in the afternoon, leaving me over-anxious about the high bank that Caspar had to deal with. It was a shame that Jenny and Martin Holliday appeared to be away: I spent a while on my own, doggy minding, boat work (as opposed to housework! ), shopping in the quite smart and well stocked Co-op, and Garlands, the impressive organic shop. I finished the latest Donna Leon book on my amazing Kindle (a surprise unbirthday gift from Nick) and also ‘The White Tiger’ (Booker Prize 2008). This was a bit of a macabre read and certainly gives a not particularly sympathetic perspective of the old and the new India. Thank you Bernard of Newbury Meeting for suggesting the read and even providing the material. It was lovely to meet Trish Brazil on Wednesday – lots of catching up with news about our respective families. We went across to the FerryBoat – that was really nostalgic for me as it was the popular venue for the thespian get-togethers, so many years ago with friends who are no longer with us! Nick returned in the evening, and this morning we set off towards Reading on a lovely bright day. Some cloud bubbled up and I found it a little chilly, but by late afternoon it was positively balmy. I continue to be amazed by the roses, at their most beautiful and so early! There was an amazing show around the lock keepers shelter at Shiplake. Early on in the day the iris, in a variety of beautiful colours, were at their proudest and perfect best at Mapledurham Lock. After supper I sat in the cratch with the sun, still quite warm, downstream of us, which seemed bizarre to me tho’ Nick pointed out the river does meander somewhat!! We’ve had another lovely day. I had just been telling Nick about some recent research about sleep – apparently those who well over the average of 7or 8 hours (as are those who achieve much less) enjoy (not quite the correct word!) a distinctly shorter life span. Nick, who had certainly slept his eight hours, leapt out of bed unusually early for him. So we were cruising downstream soon after 7.30. It was another bright but chilly day and we were through Marsh Lock, the Henley lock, and cruising into Henley well before nine. We moored in a prime position right by the 14th Century, Angel on the Bridge, Pub. By the time I’d done my shopping Nick had hooked up with an Aussie from Sydney (flown in yesterday) who joined us on our journey downstream through this very attractive part of the river where the wooded southern Chilterns lie to the north of the river. We have often said that meetings on the waterways invite surprising intimacy in a short time, and today was no exception. David Drabble left having invited us to stay with him in Sydney on our travels. He is somebody who loves the water, and old boats (he has a lot to do with the restoration of an iron-hulled tall ship which plies Sydney Ha rbour regularly). He also sails, and is especially interested in steam boats. We left him at Hurley Lock to find his way back to Henley to a wedding party, and travelled on towards Marlow where we have a delightful mooring looking downstream to the beautiful bridge. We’ve both had an explore, Caspar has had a couple of swims, and I have had kittens about a tricky jump he had to make to get back on board. Last night, after we'd gone to bed, some wazock motored past at a crazy speed creating a bow wave which caused us to bob about like crazy. Even after fifteen minutes we were still bouncing. I guess it wasn’t this that caused difficulties with the engine, but Nick had a long investigate this morning and there were multiple exclamations and groans, and a trip up to the motor accessory shop to get a new water pipe was in order. While this was going on both Caspar and I enjoyed the towpath, the view and sunshine; this after I had been up to town and sorted the washing up. We set off soon after lunch but had to stop on our way for further adjustments to the engine. So we have only travelled five miles through Cookham and on to a mooring below Cliveden where the wooded banks rise steeply on the Cliveden side of the river. I sat on my very own island – that’s apart from a couple of other small launches at the extreme ends - watching the sun go down: it was positively balmy. Caspar, however, was a bit miffed that there was no access into the river. Tomorrow we travel the couple of miles into Maidenhead where I hope to go to Quaker Meeting before we head for Windsor. I had had some concern for several days centered on the engine cooling system - continuing loss of level in the header tank though I thought I'd resolved the issue by tightening jubilee clips all over the place. Whilst Jackie was shopping, I decided to do a maintenance check on th e engine and found that one of the cooling water pipes had split, and, one of the engine mounts had worked loose. A walk to Marlow's Ford dealer fortunately enabled me to get a new pipe that I was able to modify to fit my engine and, my foresight in taking a scissor jack on board, before we left, allowed me to adjust the engine mount. However, when we set off from Marlow there was a considerable amount of vibration at lower engine speed so I moored up just upstream of Bourne End and did a bit of tweaking of the height of the mount. The remaining journey to Cliveden Island was a lot smoother. David, our guest of yesterday, would have enjoyed today's short trip because, as we came out of Cookham Lock, we were approached by a steam-driven boat. We have, in fact, seen several steam powered boats on the Thames, but this was the grandest of all, the others being no more than small launches. However, this in no way compares with the steam-powered narrowboat we saw a couple of years ago in the north-east. We had some welcome rain on our island and poor Caspar had 20 yards north and 30 yards south for his morning jaunt by which time the rain had stopped. Then it was full steam ahead into Maidenhead and Boulters Lock where there was a delightfully helpful lock- keeper who I asked for advice about getting to the Meeting House. He was able to give me detailed instructions for mooring and getting to my destination. When I expressed surprise at his knowing the location I sought, he said we were both Children of God. When I returned his ‘God bless you’, he responded ‘Amen, received in faith!’ What a remarkable start to my Sunday! It was a good 20 minute walk to the Meeting House – a small building, right in Central Maidenhead, with a delightful garden and Garden Room, so delightful that one does not even consider the multi-storey car park adjoining! (well, it looked like that!) I was first to arrive but I was joined by Ted Milligan. Now I’ve heard of his name, a lot, not surprising when he gave ministry in which he shared a poem by Francis Thompson and an anecdote a bout a formidable looking man on a bus, and a possible wasp, which turned out not to be a wasp. Ted lives in Reading but prefers the intimacy of the Maidenhead Meeting. I felt very much at home and welcome. After the trail back to the boat we set off in an increasingly gusty and chilly wind which made some manoeuvres tricky. The engine was also causing Nick concern. By teatime we were approaching Windsor with many small boats and some big leisure cruisers plying the waters. When the Castle suddenly appears it is really amazing. We soon found a mooring – another formidable jump for dear Caspar, unnecessary as it turns out as the more suitable moorings for narrow boats were spotted just around the corner next morning. If the wind was bad on Sunday it was even worse yesterday as we proceeded downstream. Talk about the ‘Cast not a clout’ – we always get a cold snap at the end of the month. Luckily no frosts so the flowers, particularly the roses continue to impress. Nick’s concern with the engine continues and needs items which he hopes will sort the problem and as I write this he has found a place a few miles south of the river, to which he has ridden on the bike, while I remain on a favourite mooring. We are moored by a boat with two flatcoat Labs who are incredibly friendly but the younger male, a large dog known as Harry, Caspar finds a tad intimidating. On Tuesday evening Nick had a call from Basingstoke: Emm has given birth to a 6lb 12oz little boy; to be known as Noah George. He is ten days early and there has been a little concern over his first few days, the need for anti-biotics, and a sunlamp to address jaundice, but tonight we hear that they are home, a variety of tests indicating that there is little to worry about. It’s been a busy few days for both of us and it seems this is likely to continue awhile. Nick did manage to get what he needed for the engine, which is better but still not running as it should at low revs. We travelled onwards on Wednesday down to Hampton Court, always an impressive place to stop, and I made a visit to the quilt/craft shop where I set myself up with materials to do some Welcome Bunting for little Noah; already I have appliquéd the "h" and the "a", I've completed two of the pennants and the "o" is well on the way! We then headed on downstream to Kingston which is a nice place to stop, with lots of shops and an especially impressive John Lewis complete with a subterrainian Waitrose. Whilst I was gone, Nick hooked up with Fred (female) and Tony on their replica Dutch barge which I was encouraged to go and admire – Nick still has dreams of acquiring one, living on one, doing the Channel and the Dutch and French canals ….Aaagh!! They are waiting for a window of fine weather to do the Channel. Rather them than me! On Friday morning we were moored just above Teddington ready for our tidal crew, Susie and Alan, to join us. Just before eleven in cool and cloudy conditions we were through the lock and approaching impressive and beautiful Richmond, then Kew and before long we were turning into the canal approach at Brentford and starting the ascent up the eleven/twelve locks including the Hanwell Flight to the junction at Bull’s Bridge. The weather had improved somewhat as we started our route east through north, very slowly behind a pair travelling abreast one roped to the other which made it impossible to pass – not a typically courteous boater who would have pulled over to allow us past, in fact he seemed quite the opposite hogging the centre of the canal. We finally stopped in Greenford, where we enjoyed a couple of drinks in the busy Black Horse Bridge pub before Alan and Susie set off back to the leafy suburbs of Kew having encouraged Nick and his crazy boating plans! After a noisy night adjoining a busy industrial complex where lorries appeared to be loading all night with what might have been curried meals for supermarkets (the smell gave us the clue), we set off before ten and arrived in Little Venice soon after midday. It has been dull, windy and cool today, with occasional damp in the air. We (well, I) lit the fire tonight – it’s been laid since we moved on board almost a month ago and I’ve threatened to light it several times on cold mornings. Within minutes it’s feeling tropical!! At least the washing, which arrived back from my visit from the launderette, is well and truly aired. On Sunday we were up quite early to tidy the boat and then I shot off to catch the No18 to Euston to Friends House arriving half an hour early, as I hadn’t checked the start time. I was told that with the Bank Holiday a big turnout was not expected. However the Meeting Room was full and the silence precious, even when the gentle baby burblings from outside the door punctuated the quiet. I love coming to Friends House because of the visitors from around the world and UK Friends are invited to introduce themselves after the meeting. I did not stay for coffee or the bring-and-share lunch to which all were invited, nor to the structured meeting which followed – that would have been interesting. Instead, I hurried back to the boat where I knew Patrick and Elanor would have arrived, having travelled up from Reading where they were spending the weekend. Elanor and Caspar met me along the towpath as I approached, and much confusion was caused by my calling the dog when a child called Caspar was walking over a bridge above us! It was great to see Elanor again and of course, Patrick. I had a quick coffee and then we went to find somewhere for lunch. Elanor’s choice of an Italian place along the Paddington Arm was good – with attentive and child-friendly staff and Elanor eating enough for an adult! Nick returned to the boat while the three of us went to Camden by tube (3 changes!) I think it was a good choice – it’s an amazingly lively and colourful place and surprisingly we came away without buying anything. Footsore we returned by tube to Euston and then by double-decker bus to Little Venice. Then, sadly, hurried leave-taking as our guests had to be back in Reading for supper. Elanor was still full of bounce, leaping off seats to touch leaves on nearby trees. We also agreed that she could be a magnificent actress as she does wonderfully expressive faces – tho’ she admitted it was "tricky doing sad faces when you were feeling so happy!" A quiet evening and early night followed as Nick had an early start, travelling back ‘home’ to greet his new grandson, Noah, with the special bunting I had just managed to complete while sitting in the cratch in the evening sunshine. As the weather was forecast "wet", I dressed accordingly in water-repellent trousers (alongside other things), a decision I had reason to be thankful for later in the day when cycling across Newbury in constant, if not too heavy, rain. Having breakfasted well, I caught the 09.18 train from Paddington which duly arrived, on time, in Newbury at 10.10. Stopping for a coffee with brother Tim (he of the blog, about which previous warnings as to content are now doubly applicable), I borrowed his bike to speed my way out of town to the north-east to meet the latest addition to the family, Noah. After a few pleasant hours with the young family, and when Mum and Dad were ready to follow the example of their two sons in having an afternoon nap, I took my leave and cycled in the pouring rain back into the town. An old friend, met briefly in B&Q a couple of weeks ago, had been on my mind, so, with a selection of return trains to choose from, I continued out of town to the south, and called on spec. Two hours later, after a pleasant interlude, I was on my way to return the bike and catch the train. Soon after eight, I stepped aboard Gloriana, a meal on the table completing a memorable day.